Create a bold and stunning focal point in any space with the grand presence provided by the Candle decorative uplight chandelier from Adot Lighting. Taking inspiration from the beautiful scene of crystal clear water dripping off twigs, Candle endeavors to create a symphony of nature-inspired artistry to intensify the aesthetics of your well-curated decor. With a splendid blend of refined details and elegant lines, this transitional centerpiece is a designer upgrade to a variety of architectural themes, from modern to rustic and everything in between. 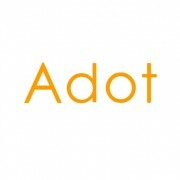 Adot's passion for design, technology and engineering translates into a product that integrates cutting edge LED technology in an upscale styling to deliver a picturesque ambiance with energy efficient and maintenance-free LED lighting. Available in 6-, 8- and 12-light configurations, this single-tier chandelier is designed to accommodate installations in a multitude of spaces including living rooms, dining areas, bedrooms, foyers, entrance halls, and more. The elegantly curved arms outstretch from an exquisitely stylish central hub and swoop up gracefully to create an open feel. 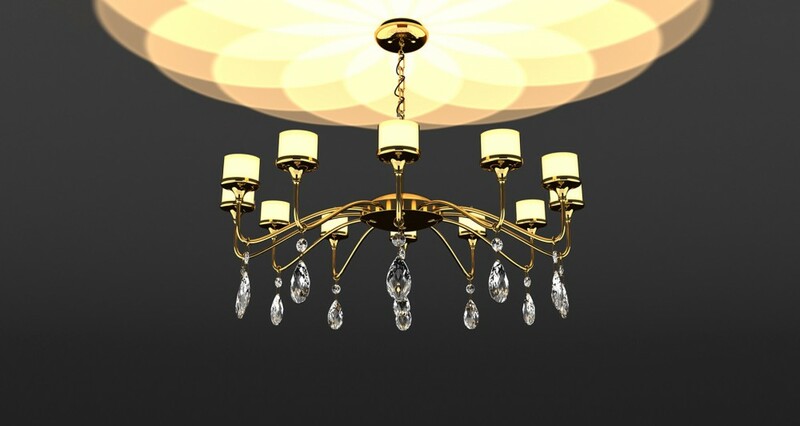 The chandelier's gorgeous aesthetic is complemented by sleek bobeches which hold the lights atop. Constructed of 5052 aluminum alloy, the slender grace of the metal frame is finished in gold, chrome or black. The luxurious gold finish ensures a rich elegance and magnificent look. The shiny chrome finish reinforces the fixture's contemporary appeal and sophisticated feel. The attractive black finish adds a wonderful contrast to the white etched glass shades. The elegant arms are embellished with sparkling drop accents. These hand-cut K9 crystals add a glittering flair that completes the fixture's design ethos. 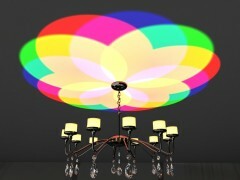 Cutting edge LED technology takes this artistic centerpiece to an unprecedented level of sophistication. 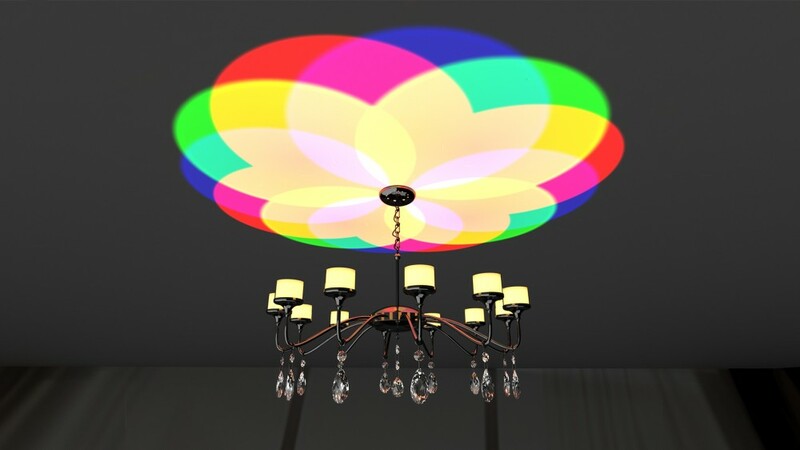 This revolutionary light fixture creates a dramatic display of light on the ceiling. Equipped with high performance LEDs in monochrome white or RGBW color options, the fixture's uplight modules cast stunning floral patterns through precision molded optical lenses. The beautiful and artful presentation of light brings incredible visual depth and a grand scale of visual dimension to stark interior design schemes. The vibrant ambiance created by RGBW LEDs lends stunning accents and aesthetic effects to any space the chandelier resides in, while the 3000K warm white flower pattern delivers understated luxury, timeless elegance and balanced harmony that would easily fit into modern, contemporary and transitional decor. The Candle Series also includes an ambient atmospheric lighting model which produces a breathtaking flood of pink light that instantly fill a room with a romantic ambiance. With their impressive light, exceptional optics, exquisite details and elegant styling, the Candle chandeliers make every room look spectacular and attractive. This decorative light fixture is engineered to deliver lasting beauty. The aluminum frame is fabricated to the highest metalworking standards and use high quality material to ensure its sleek look and structural stability. The luminous finish is created through a proprietary electrochemical process to ensure its high corrosion resistance, excellent color and gloss retention for an ever-glamouring appeal. The fixture incorporates state-of-the-art LED light sources to deliver superior quality of light with minimal energy consumption. Excellent thermal engineering keeps LED junction temperature below the maximum acceptable for excellent LED lumen maintenance and color stability. The fixture utilizes high performance power electronics to provide constant currents precisely matched to the electrical characteristics of the array of LEDs. In addition to efficient and reliable load regulation, the LED driver has leading / trailing-edge (Triac) dimming capability with a continuous dimming range from 5% to 100%. With smooth dimming, the chandelier can be fine-tuned to achieve tons of atmospheric lighting effects. Equipped with a 2.4G RF remote control, Candle let you harvest its artistic ambiance anywhere in the room. Sit casually on a sofa or relax in bed with room ambiance tailored to your mood reaping the convenience of wireless light control. In addition to brightness adjustment and CCT tuning, the remote control allows to set pre-formulated atmosphere with four embedded lighting modes including Night Light, TV Watching, Guest Accommodation, and Comfortable Warmth.